Fifty Years of Experiments in Art and Technology celebrates the continued legacy of the non-profit organization E.A.T. through a series of campus events including talks by Julie Martin and Michael Connor, and the Simons Center Gallery exhibition RESOUND. The collaborative group E.A.T. was founded in 1966 by artists Robert Rauschenberg and Robert Whitman with Bell Lab engineers Billy Klüver and Fred Waldhauer. It supported sustained decades of partnerships across the United States on technology-based art projects, offering both financial and cultural support that helped pioneer new alliances between the arts and sciences. The E.A.T. collaborations featured some of the first fine art uses of video projection, wireless audio, and Doppler sonar never before seen in artistic practice. This revolutionary combination of artists and scientists created an expansion of the role of technology in art that endures today. 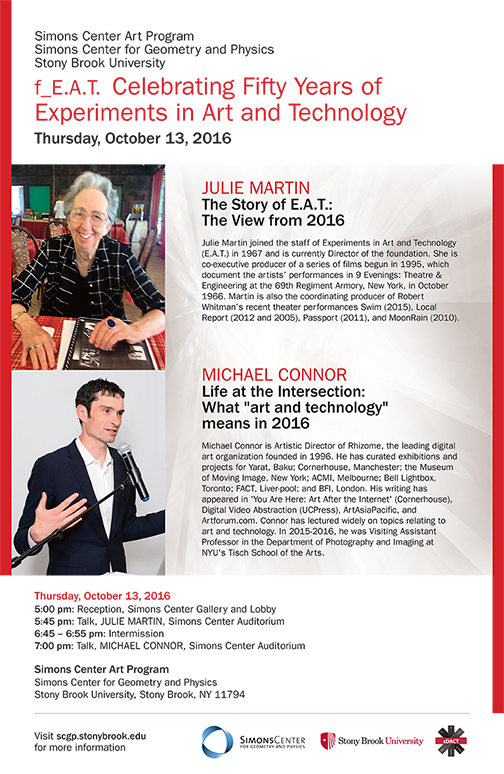 Julie Martin joined the staff of Experiments in Art and Technology (E.A.T.) in 1967 and is currently Director of the foundation. She is co-executive producer of a series of films begun in 1995, which document the artists’ performances in 9 Evenings: Theatre & Engineering at the 69th Regiment Armory, New York, in October 1966. Martin is also the coordinating producer of Robert Whitman’s recent theater performances Swim (2015), Local Report (2012 and 2005), Passport (2011), and MoonRain (2010). Michael Connor is Artistic Director of Rhizome, the leading digital art organization founded in 1996. He has curated exhibitions and projects for Yarat, Baku; Cornerhouse, Manchester; the Museum of Moving Image, New York; ACMI, Melbourne; Bell Lightbox, Toronto; FACT, Liverpool; and BFI, London. His writing has appeared in ‘You Are Here: Art After the Internet’ (Cornerhouse), Digital Video Abstraction (UCPress), ArtAsiaPacific, and Artforum.com. Connor has lectured widely on topics relating to art and technology. In 2015-2016, he was Visiting Assistant Professor in the Department of Photography and Imaging at NYU’s Tisch School of the Arts.